Fr. Miladin Garic reposed peacefully last night about 1 AM, November 24. Fr Miladin passed away on the day of St Stefan Decanski. From Sunrise to Sunset Avenue, heading west along one of those gorgeous, tree-lined streets that you find all throughout the cozy community of Fair Oaks, look to your right after passing the sign for the cemetery. Turn your gaze upward toward the heavens. You will suddenly gasp as you see one of the most impressive and elegant examples of Eastern Orthodox Church architecture that you’ve ever seen on the West Coast. You will behold the house that Miladin built. Miladin Garic was born in Serbia on the first day of the year 1921. As if mysteriously anticipating the formal title of “stavrofor” (cross-bearer) that would be conferred upon him by the Serbian Orthodox Church late in life, young Miladin would be charged with so many heavy crosses of trial and suffering that he was made truly worthy an honorific that many Orthodox clergy take for granted. When World War II exploded across Europe, Miladin was forced to finish his theological studies in a camp for displaced persons in Italy, where a group of fellow displaced persons, who also happened to be uprooted Orthodox clerics and theologians, got together to help Miladin complete his studies. It was a propitious start to what would turn out to be a long and heroic life in service to God and his fellow man. In 1941, when the Axis powers headed by the Nazis carved up Serbia, Miladin joined a resistance army committed to oust the occupiers of his motherland. In this capacity, Miladin was twice wounded in action. He was decorated with the national Medal for Bravery. His godson, Fr. William Weir, said, “Proto Garic experienced the full extent of tragedies that accompanied the war alongside all of the Serbian people.” This became most poignantly true in October 1944, when the fascist Ustashi burned down the house containing Miladin’s nearest and dearest: his mother, grandmother, sisters, and two brothers. All died in the fire. Miladin escaped to Austria with the rise of communism in Serbia. No longer a resistance fighter, he found his way to England in 1948 where he would take up the burden of manual labor, toiling in factories, hospitals and—like so many other displaced Serbs in other countries—in the mines. It was also in England where he would meet his wife, Nina. They married in July of 1948. In June of 1953, Miladin became Father Deacon Miladin. Less than a month later, a pious and energetic Archbishop of the Russian Orthodox Church with an affinity for Serbia and the Serbs ordained Fr. Miladin to the priesthood. That Archbishop was the glorified saint who is now known throughout the whole Orthodox world as St. John Maximovich of Shanghai and San Francisco. The newly ordained Fr. Miladin, having been made an Orthodox priest by one of the holiest men of his time, was assigned to minister to a parish Vancouver, Canada. He served that community for seven years, and people there who remember him do so fondly. After 32 years serving the Christians of Fair Oaks—administering the sacraments, serving liturgies, visiting the sick, conducting funerals, and organizing festivals—Fr. Miladin would eventually oversee what was perhaps his greatest accomplishment: the design and construction of the beautiful, brick Church on Sunset Avenue in Fair Oaks, dedicated to the Assumption of the Virgin Mary; an impressive and elegant example of traditional Orthodox church architecture. Orthodox Christians often observe that the death of a holy person will occur auspiciously; that is, a sign of God’s approval will accompany the passing of those whose lives have been pleasing to Him. Fr. Miladin died less than a week before one of the most momentous events in the history of the Serbian Church in America: the translation of the relics of St. Sebastian to San Francisco and Jackson. This newly canonized saint was the founder of the parish of the little white church in the Sierra foothills. So, at the exact moment when St. Sebastian was returning triumphantly to the spiritual community that both he and Fr. Miladin nurtured and loved, the soil was still fresh—the flowers still fragrant—on that spot of Earth from which St. Sebastian, Proto Garic, and Protonica Nina will be called forth by the Light to arise and greet a glorious and never-ending day. The Orthodox would call this divine favor. 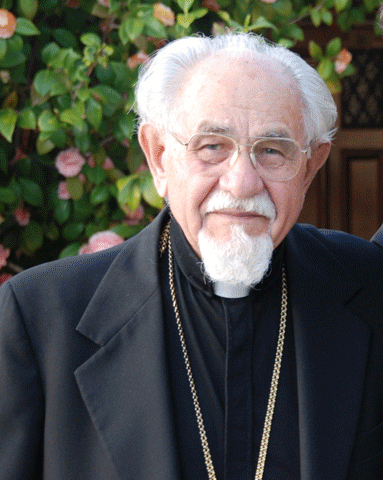 May the memory of Protopresbyter Stavrofor Miladin Garic be eternal!